Saturday November 19th 1898 I helped a little with the work. Will came before noon but we did not come home till after dinner. Edith ate a little today and says she feels better. I came home so much better satisfied about her. I did the evening work alone. I let Pink go home. Sunday November 20th 1898 It was a bright warm day. It was 14 years today since Charlie & Ida were married. I was busy with the work all forenoon. The children from below were here awhile in the afternoon. I wrote in the evening. Monday November 21st 1898 I was busy most of the forenoon with baking. I took time to write a letter to Ida. It rained so the boys could not husk corn. Will helped me pick four ducks in the afternoon. I got them ready to sent to town. It turned very cold jist before night. 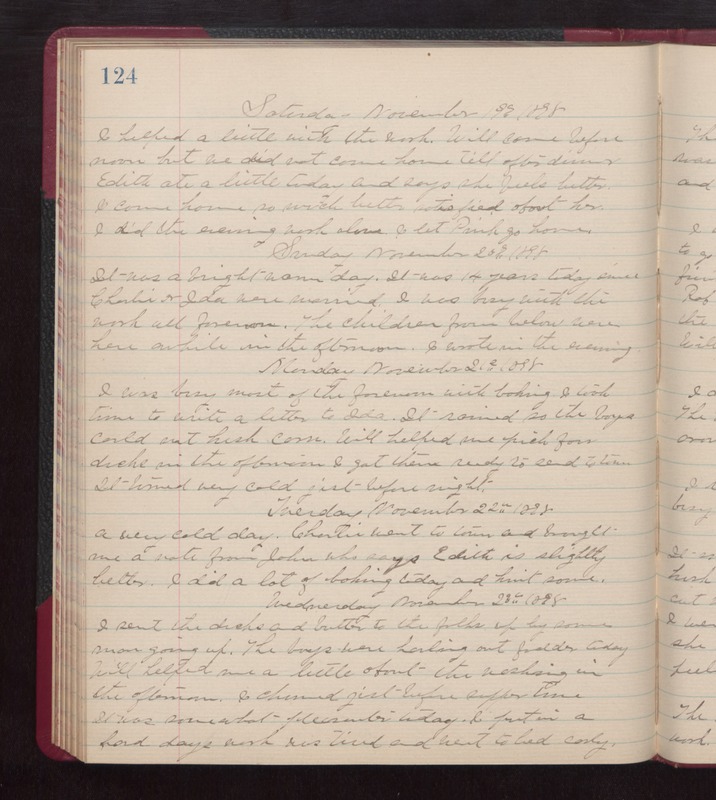 Tuesday November 22nd 1898 A very cold day. Charlie went to town and brought me a note from John who says Edith is slightly better. I did a lot of baking today and knit some. Wednesday November 23rd 1898 I sent the ducks and butter to the folks up by some man going up. The boys were hauling out fodder today. Will helped me a little about the washing in the afternoon. I churned jist before supper time. It was some what pleasanter today. I put in a hard days work, was tired and went to bed early.